Democrat Kamala Harris has beaten Loretta Sanchez, a Democrat, in the race for the California Senate seat currently held by Barbara Boxer. California voters chose between two Democrats because the state’s primary system advances the top two vote-getters, regardless of party affiliation, to the general election. Sanchez easily beat several Republicans to win the second-place spot in the June primary but came in 20 points behind Harris. Harris has been endorsed by President Obama and Vice President Biden, along with many other national Democratic figures. She was first elected attorney general in 2010 and reelected two years ago. Harris, 51, whose mother was born in India and whose father was born in Jamaica, would become the only African American woman in the Senate if she wins the seat. Sanchez, the daughter of Mexican immigrants, was first elected to Congress 20 years ago. Her sister, Linda T. Sanchez, also serves in the U.S. House. Sanchez describes herself as a moderate Democrat and talks up her longtime membership on the House Armed Services and Homeland Security committees. 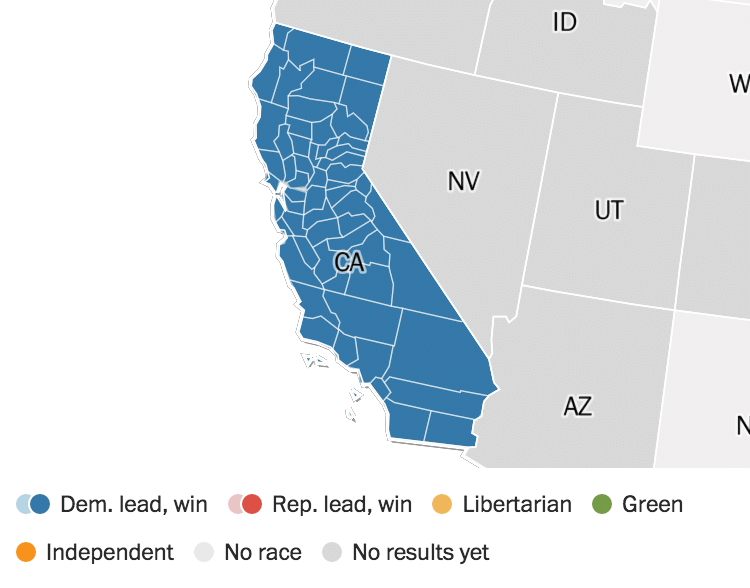 California voted for Hillary Clinton, the Democratic former secretary of state, in Tuesday’s presidential election.